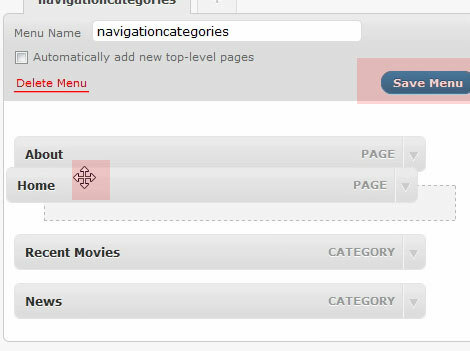 How to add wordpress categories to your navigation bar, using menu option of wordpress 3.0 with Twenty Ten theme. 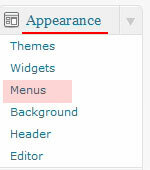 With Menu option in admin dashboard of wordpress 3.0, we really can customize the menu tabs navigation easily. This tutorial is going to create wordpress navigation bar based on list pages and categories you choose. At the end, we create, home, page 1, category 1, category 2. Now, if you are using another theme and older version of wordpress, you might want to check this tutorial to add categories lists in your navigation. 1. First, create a page which you want to be in the front. You can also use Category to be in the front. In this demo, i made “Home” as my front page. 2.Click on the “Appearance” and then “Menus” button. 4. Add the pages, and categories you want to this custom menu we have just created by clicking “Add to Menu”. 5. Drag and drop to customize the navigation tabs position. 6. Click “Save Menu” and refresh your blog. It should have your own customization and your categories are added in your wordpress navigation bar. Tips: Once you want to reset your navigation, click “delete menu” option, and then “Save Menu” blue button in the right. Thanks, this was very helpful! Thank you! I was looking for this! Hello. That’s a great tutorial. But I want to ask, the default Home is still there (which appears to be all of the blog post I have been post before) how can I get rid of that page? Thank you, that was helpful! I m searching on google for this for almost 2 hrs and got this on yours site.Very helpful content…. Thanks you so much for this. I started a blog a few weeks ago, and no matter how many tutorials I read, I couldn’t figure out how to do this. All of the other site things I’ve tried to do have been relatively easy and intuitive, but not the menus/navigation bar. Your tutorial, and especially the video, finally did the trick. I can’t thank you enough! Thank you, exactly what I had been looking for! Who would have thought it was that easy. Comment form on this post is closed after 60 days. How to sell ebook in a wordpress blog?